Microsoft Office 365 is a cloud-based office environment for organizations of all types, from entrepreneur to global enterprises. Includes document creation and sharing, e-mail, instant messaging, audio/video calling, online meetings, and public websites. The platform links together Microsoft Exchange Online, Microsoft SharePoint Online, Microsoft Lync Online, Microsoft Office Web Apps, and Microsoft Office Professional Plus. 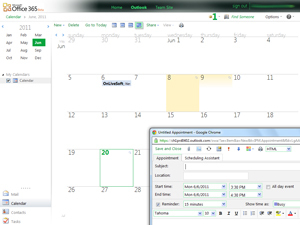 Office 365 is available in a number of different plans, providing different sets of features at different price points.